"Smile! It Keeps People Wondering!!!" Thanks to all the Incredible artists that made me a graphic. They're all fantastic and beautiful! All the Graphics on my page are Clickable! So, if you see something that you like show the artist some LOVE and VOTE!!! 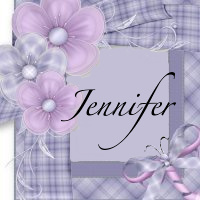 Login or register to add Jennifer as your friend! Hi can you make this in beth?